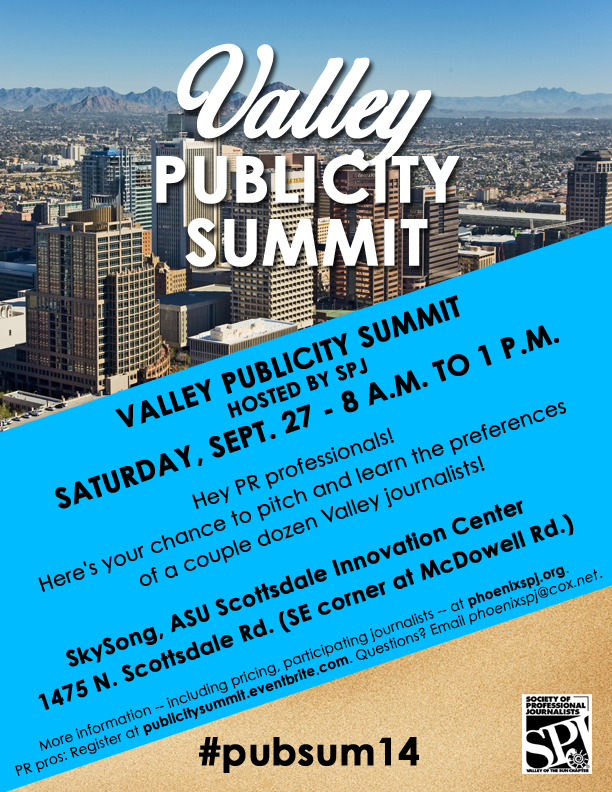 Join us for the Valley Publicity Summit, hosted by SPJ! The event that brings journalists and public relations professionals together for an entire Saturday morning is coming soon! PR pros: Sign up here! The Society of Professional Journalists, Valley of the Sun chapter, presents the Valley Publicity Summit, hosted by SPJ, the amazing event where a roomful of locally based journalists share insights, give their story pitch preferences and industry updates with area public relations practitioners. In fact, we’ve arranged to have two rooms! It’s 8 a.m. to 1 p.m. Saturday, Sept. 27, at SkySong, 1475 N. Scottsdale Road, Scottsdale (2nd floor of SkySong 1 building, the NE building of the complex). A map is at our registration site on Eventbrite (details below), and the hashtag is #pubsum14. JOURNALISTS: Here’s your chance to guide PR practitioners in their interactions and respond to their story interests. Likewise, PR professionals have the opportunity to acquaint you with potentially newsworthy information. If you would like to volunteer to be one of the journalists at this event, please email Mark Scarp. JOURNALISTS EXPECTED TO ATTEND INCLUDE (SO FAR): Kathy Tulumello,business editor, Arizona Republic; Nicole Crites, morning anchor, KPHO-TV (CBS5);Heather Dunn, managing editor, KPNX-TV (12 News); Al Macias, managing editor, and Carrie Jung, reporter, KJZZ-FM; Sue Doerfler, deals reporter, Arizona Republic; Marie Look, editor-in-chief, Scottsdale Magazine, Ilana Lowery, editor, and Hayley Ringle, technology/startups reporter, Phoenix Business Journal; Laurie Merrill, digital business reporter and former public safety reporter, Arizona Republic; Kate Crowley,contributing blogger, “Chow Bella,” Phoenix New Times; Amanda Ventura, associate editor, AZ Big Media; RaeAnne Marsh, editor, In Business Phoenix Magazine; Teri Carnicelli, editor, North Central News; Tom Gibbons, editor, Talk of Arizona online quarterly, Kristy Durkin, blogger, whereshouldweeat.com…. AND MORE TO COME…. PR PROFESSIONALS: Sign up here! A schedule of the day’s events is at publicitysummit.eventbrite.com. Our event organizing committee consists of Valley of the Sun SPJ chapter members and several public relations practitioners in the Valley.